The BoxBoy! trilogy says its final goodbye as BYE-BYE BOXBOY! is now available in North America on the Nintendo 3DS eShop; it arrived in Europe in late March. Featuring creative new puzzles and gameplay mechanics, this one has HAL Laboratory put in all of its creativity into this last game in the series. You can unlock special costumes with supported Kirby-series amiibo, and if you have save data from both BOXBOY! and BOXBOXBOY! or you get a perfect score on all the levels in the new game, you can unlock Qucy and a retro Game Boy colour scheme. 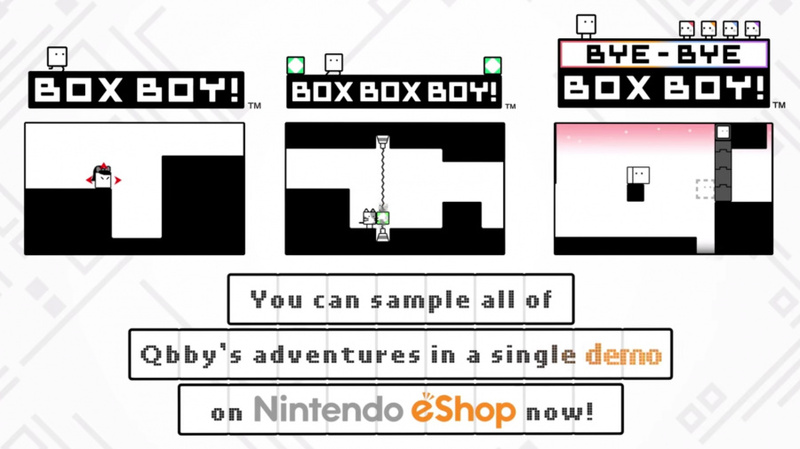 Finally, a BoxBoy! Trilogy demo is also now available on the Nintendo 3DS eShop. Are you sad to see Qbby go? Be sure to play the demo soon and let us know your thoughts in the comments! Robert has a deep interest and history in interviewing as well as discussing Nintendo and Pokémon topics, especially games. He says his favorite game is Super Mario Sunshine. Water you going to say about that? Just don't FLUDD his inbox. I want the amiibo. To play asia! Yeah, wasn't there a boxboy amiibo? Was that not shown? Still though, I'm about to download the game! @retropunky Ah, I see. Well that's no fun. So, there's no amiibo for the West? Have to order it through eBay. Ugh... but I don't wanna take my 3DS back out just for this, I haven't touched it since the Switch came! @ShadJV It seems there was an unintended Switch backlash. A few of us have been saying the same. I hope this isn't actually the last one, I'm not much into puzzle games but I've got all 3 of these. Will definitely be downloading the game, though, no questions about that! Wanted the amiibo and retail release, but never the less will buy it. I still need to try these games. I might download the original for the car ride down to the beach this Friday night. Could be a good time waster! Sad to have to import Qbby still, and to see the series go, but this is an insta-buy for me ofc. @retropunky most things on play asia are overpriced. there are almost always cheaper options. I agree with most of the comments, I would like that cute little box amiibo! This series has passed me by, so I'll try the demo. I didn't realise it was HAL. @Oat Funny you mentioned that, I actually just got done the demo! 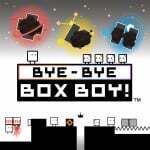 I loved the stages, especially from Bye Bye BoxBoy. Would it be frowned upon to start with the last game or is it okay? @wiggleronacid I absolutely love this series. There's a narrative throughout the games that you might enjoy if you play all 3 games. From a gameplay standpoint there's no need to play the prior games but in my opinion it's good to start with the first, that way you wont get that sequel backlash of going back to play prior entries after seeing the improvements that the later games make. Up to you though. @Oat Thanks for the information and I'm glad to hear they're all good games. I'll definitely be downloading the first game for the car ride home tomorrow! @wiggleronacid Great to hear! I hope you enjoy it! The whole trilogy on my home screen is looking nice.